Enrollment for the Availa Kares College Savings Program is available for all Kindergartners that were registered in one of the following Hamilton County kindergarten programs beginning with the 2018-2019 school year: Northeast Hamilton, South Hamilton, Stratford, St Thomas Aquinas or Webster City. 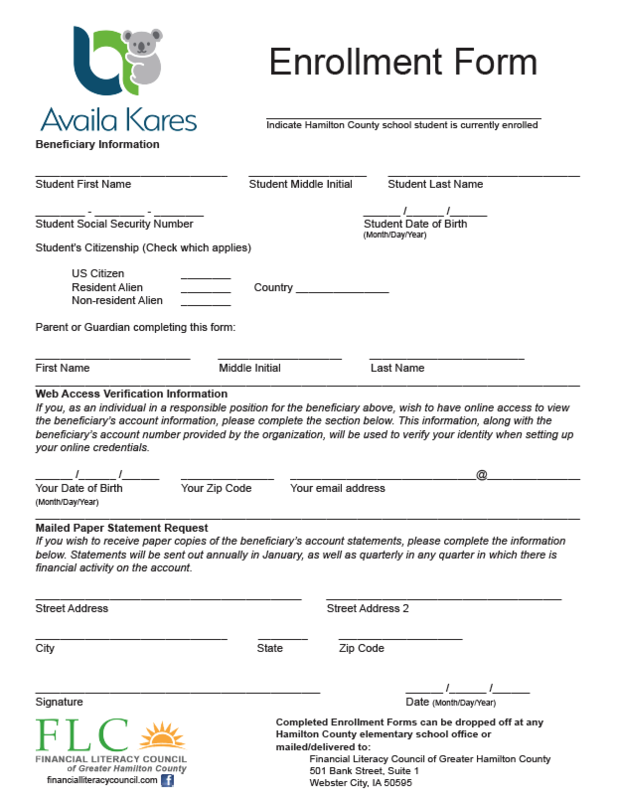 In order for a student to become a beneficiary of a 529 College Savings Program through the Financial Literacy Program with an opening balance of $100, the following enrollment form must be completed and returned prior to the last day of school during their 2nd grade year. Forms must be returned to the elementary school office, or mailed/delivered to the Financial Literacy Council offices located at 501 Bank Street, Webster City. Copyright© 2019 Financial Literacy Council of Greater Hamilton County All Rights Reserved.